There are several blockchain games on the market but none are licensed with an official sports organization except for Lucid Sight’s MLB Crypto Baseball. The team at Lucid Sight has been working for over a year to bring these MLB digital collectibles to life and come alive they have! Today is the official launch of the game where you can collect figures, create a roster on a game-card and play along with LIVE MLB games. But how is that helping with mass adoption of cryptocurrency? This morning the Los Angeles Dodgers tweeted an announcement that they will be holding a first ever Digital Bobblehead Night at Dodgers Stadium on September 21, 2018. Thanks to Lucid Sight, crypto is getting it’s time in the spotlight among millions of otherwise unknowing MLB fans. Sure, people will have questions and some may even fear the technology, but the main take-away here is that people who normally wouldn’t have heard of crypto or blockchain are now aware these technologies exist and can own their own digital collectibles. It doesn’t stop with MLB either. 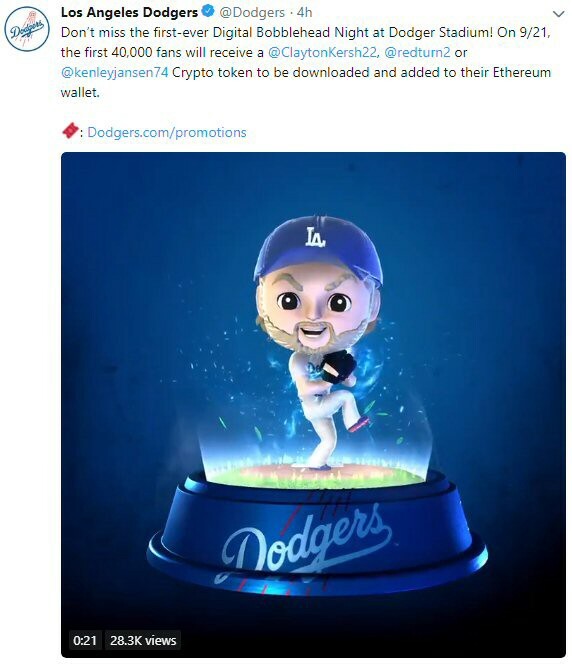 News of the Los Angeles Dodgers’ digital collectible crypto bobblehead giveaway was also featured on several differentnews websites around the web. Regardless of the current bear market, Lucid Sight is taking the proper steps needed for mass adoption of cryptocurrency and blockchain technology. Now let’s play ball!! Follow MLB Crypto Baseball on Twitter, Instagram, and Facebook for latest news and updates! Join their Telegram and Discord!